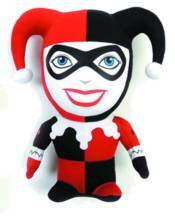 Comic Images recreates the heroes and villains of the DC Universe with these new super-deformed plushes! The costumes are familiar, the heads are over-sized, and everything is cute and cuddly! Choose from Batman, Superman, Harley Quinn, Wonder Woman, Robin, or The Joker.